As the Mediterranean’s bloated fishing fleets ready themselves for the opening of the bluefin tuna fishery tomorrow, WWF has released an analysis showing that the bluefin breeding population will disappear by 2012 under the current fishing regime. Rome, Italy – As the Mediterranean’s bloated fishing fleets ready themselves for the opening of the bluefin tuna fishery tomorrow, WWF has released an analysis showing that the bluefin breeding population will disappear by 2012 under the current fishing regime. Global conservation organization WWF reveals that the population of breeding tunas has been declining steeply for the past decade – and will be wiped out completely in 3 years if fisheries managers and decision-makers keep ignoring the warnings from scientists that fishing must stop. “Mediterranean bluefin tuna is on the slippery slope to collapse, and here is the data to prove it,” said Dr Sergi Tudela, Head of Fisheries at WWF Mediterranean. “Whichever way you look at it, the Mediterranean bluefin tuna collapse trend is dramatic, it is alarming, and it is happening now. The population of tunas that are capable of reproducing – fish aged 4 years or over and weighing more than 35kg – is being wiped out. In 2007 the proportion of breeding tuna was only a quarter of the levels of 50 years ago, with most of the decline happening in recent years. Meanwhile, the size of mature tunas has more than halved since the 1990s. The average size of tuna caught off the coast of Libya, for example, has dropped from 124kg in 2001 to only 65kg last year. Data gathered by WWF show that this pattern has been observed across the entire Mediterranean. Before the age of large-scale industrial fishing, individual tunas could even weigh in at 900kg. 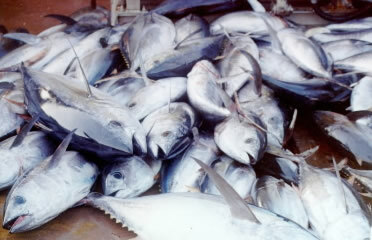 The loss of these giant tunas – able to produce many more offspring than medium-sized individuals – has a disproportionately high impact on the reproduction of the species. The huge overcapacity of fishing fleets, catches that far exceed legal quotas, pirate fishing, the use of illegal spotting planes to chase the tunas, under-reporting of catch, fishing during the closed season, management measures disregarding scientific advice – and the insatiable appetite of the world’s luxury seafood markets – have all contributed to this dramatic decline. WWF is calling for the immediate closure of the Mediterranean bluefin tuna fishery to give the species a chance to recover, while continuing to encourage consumers, retailers, restaurants and chefs to join the global movement to avoid the consumption of the imperilled fish. There is also growing support to suspend international trade of Atlantic bluefin tuna by getting it listed on Appendix I of the Convention on International Trade in Endangered Species of Wild Fauna and Flora (CITES) when contracting parties meet in early 2010. The 2007 quota for Mediterranean bluefin tuna is more than double that recommended by scientists to avoid the high risk of collapse.